Toddlers have specific needs. Are your toddler's dietary needs being met? Every parent just wants the best for their child and one thing you can do is to ensure that your little one gets the very best in their diet! One year old: one teaspoon at a time of cereal, pureed fruit, cooked meat, cooked vegetables, one egg and milk or dairy products in portions of ½ a cup at a time. Two years old: two tablespoons at a time of different foods. Three years old: should have three tablespoons at a time of different food. What should your toddler be eating? Your toddler is more active year by year and needs more solids to sustain him during a busy day. Meal-to-meal appetite changes are normal. It is important that you don't force your toddler to clean his plate. The following is a basic table and should only be used as a reference for what your 1 – 3 year old toddler should be eating. Speak to your doctor /paediatrician /dietician to find out how much of each food group your toddler needs. Whole grapes; large pieces of meats; candy and cough drops can cause choking. Small, hard foods such as nuts, seeds, popcorn, chips, pretzels, raw carrots, and raisins can also cause choking. Sticky foods such as peanut butter and marshmallows can cause tooth decay. Always cut up foods into small pieces and watch your child while he eats. Also, your child may have food allergies. The most common food allergies are milk, eggs, peanuts and other nuts, soybeans, wheat, fish, and shellfish. If you think your child might have a food allergy, talk to your doctor. 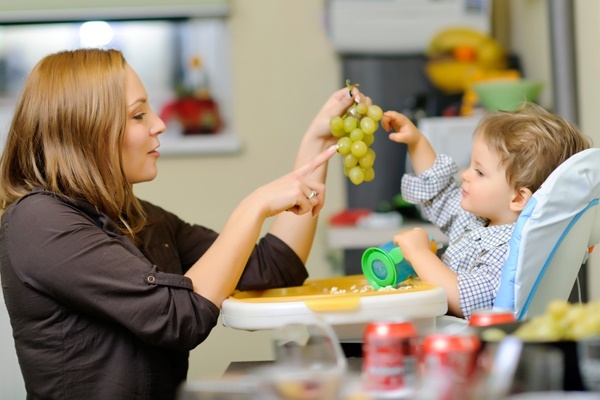 Your toddler should be on an eating schedule and join the family at the dinner table 3 times a day. Your toddler's appetite may decrease. Your child may prefer only one type of food. Do you think it's worth setting out your toddler's diet like this?